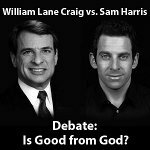 On the evening of the 7th of April 2011 (the 8th of April here in New Zealand), Christian philosopher William Lane Craig debated Atheist author and speaker Sam Harris on the question Is Good from God? Brian Auten has made the mp3 audio of this debate available over at Apologetics 315. What follows is my sketch of how the debate unfolded, along with my own analysis of the arguments used and how they contribute to an answer to the question in dispute. I emphasise that last aspect of my analysis, because It seemed to me that there was a tendency at points for comments and claims to be made which carried a certain degree of rhetorical flourish, but which, no matter how interesting they might be, drag the discussion off topic. This was the overriding impression that I got from much of what Dr Harris had to say in his rebuttal sections. Recently there has been some discussion here about the moral argument for theism, with a couple of correspondents announcing with great certainty (but unfortunately little else) that the argument is just terrible. I beg to differ. Today I appeared on an episode of the Unbelievable? radio show, hosted by Justin Brierley (actually we did two shows), and the other guest was atheist Arif Ahmed. So-called new atheist Sam Harris maintains that moral values are really scientific facts, and that they have no connection to God (indeed, God does not exist, thinks Harris). Episode 35 is an analysis of a recent talk given by Harris gave on science and human values. The talk was part of a TED conference, and you can see it here. Here I offer an explanation of how I think he has failed. In brief, I think his entire presentation is an exercise in circular reasoning. Harris has a new book on the subject, The Moral Landscape, which is to be released later this year. Here it is, the second installment of my two part series on the moral argument. Oh, and before anyone gets offended and writes to me about the parody in the blog roundup – stop and ask yourself: Are you a Windows user by choice? If so, then which of us is really worse, hmm? Here’s part 1 of a 2 part series on the moral argument for theism. The argument is largely about meta-ethics, so the bulk of this presentation is devoted to explaining the meta-ethical issues: What are moral facts at all? And could there be any such things in a purely naturalistic worldview?